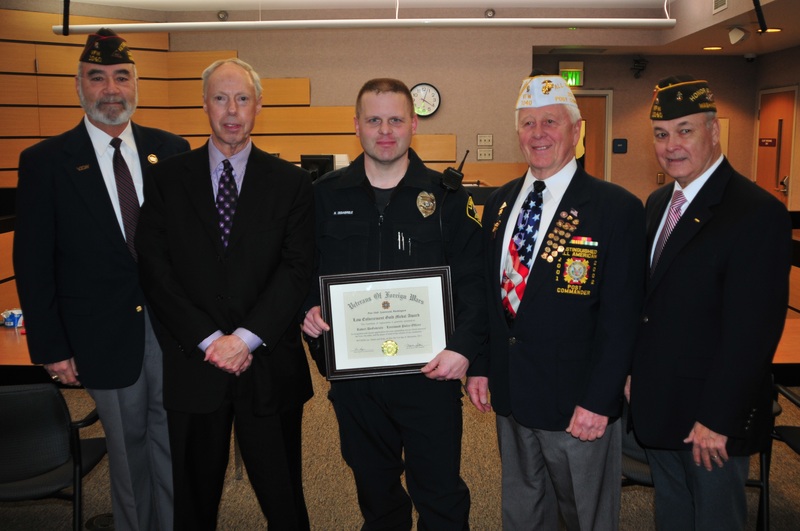 VFW Post 1040 awarded this year’s Law Enforcement Gold Medal Award to Lynnwood Police officer Robert “Todd’ DeGabriele in a ceremony held at the Lynnwood Police Station. Officer DeGabriele has on numerous occasions served as an acting Sergeant of Police as the need arose. He recently has served on a committee that was tasked with revising report documents to enhance the efficiency of the Police Departments paperwork process. L-R: VFW Post 1040 Sr. Vice Commander Frank Martinez, Lynnwood Police Chief Steve Jensen, Officer Robert DeGabriele, VFW Post 1040 Commander Martin Spani, and VFW Post 1040 Chaplain John Zambrano. He is a 13 year Veteran of the Police Department, serving with distinction as a field training officer and firearms instructor in addition to his regular duties as a patrol officer. He has been instrumental in the advancement of fundamental police training that has assisted numerous Lynnwood Police Officers in the performance of their duties.